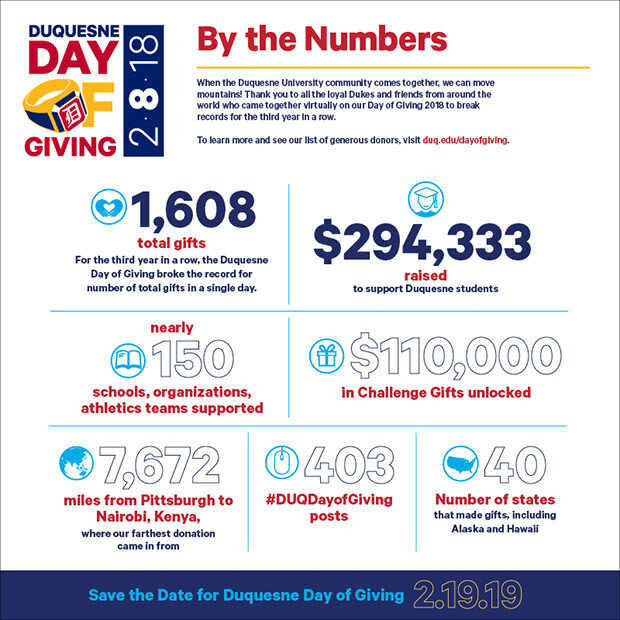 SAVE THE DATE: DUQUESNE DAY OF GIVING 2.19.19! also encouraged to spread the word about the event using #DUQDayofGiving on social media. Get The Duquesne Day of Giving Sign! Get your 2019 Duquesne Day of Giving sign at this link. 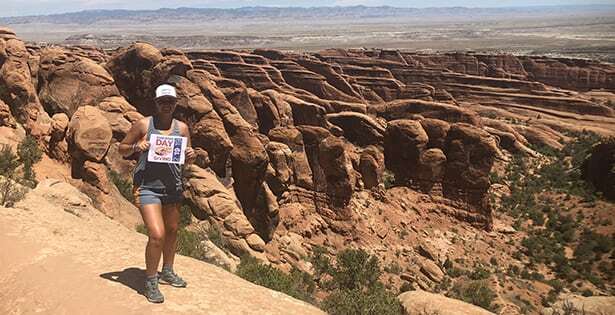 Post your picture with the sign on social media with the #DUQDayofGiving and send to jakielod@duq.edu so we can share! Issue A Participation or Matching Challenge! Do you want to make a major impact on the 2019 Duquesne Day of Giving? Already planning to make a major gift to the University? By issuing a Duquesne Day of Giving Matching Gift or Participation Challenge you can motivate thousands of alumni and friends to make a gift to the area of Duquesne University that means the most to you. Click here to learn more and let us know of your interest! Click on this link to watch a special Duquesne Day of Giving recap video produced by Duquesne University student Claudia Hardy '20, an advertising and public relations major. THANK YOU to everyone who supported the Duquesne Day of Giving by making a gift and/or helping to spread the word! It was a very special and historic day for Duquesne University, which we hope all of our alumni and friends are very proud of. We are beyond humbled and further inspired by your generosity. If you missed the Duquesne Day of Giving but would still like to make a gift, you can always do so online. We would love for your support! Save the date for the 2019 Duquesne Day of Giving - 2.19.19! An anonymous supporter and parent of a Duquesne University women's swimming alumna has made a $10,000 matching gift challenge to benefit the Swimming and Diving program. All donations on the Day of Giving to the Swimming & Diving program, will be matched dollar-for-dollar, up to $10,000. Francis Feld, N'93 will match donations to the School of Nursing dollar-for-dollar, up to $3,500! Your $10 donation on the Duquesne Day of Giving becomes $20! Kevin McQuillan B’87 and Principal at The McQuillan Group along with his wife Amanda McQuillan A’92 GA’94 will match all donations to Spiritan Campus Ministry dollar-for-dollar, up to $2,000, in honor of Kevin’s Uncle, Fr. Neil McQuillan, C.S.Sp A’71; and an anonymous donor will also match donations dollar-for-dollar, up to $1,000, for a total of $3,000. An anonymous football alumnus has made a $10,000 matching gift challenge to benefit the Football program. All donations on the Day of Giving to the Football program, will be matched dollar-for-dollar, up to $10,000. This Matching Gift is in honor of Coach Terry Russell who had such a positive influence on his life during his playing days at Duquesne and he remains excited and committed to the continued growth of the Football program under the leadership of Head Coach Jerry Schmitt. An anonymous donor has agreed to donate $10,000 if 100 individuals make a gift to the School of Education.